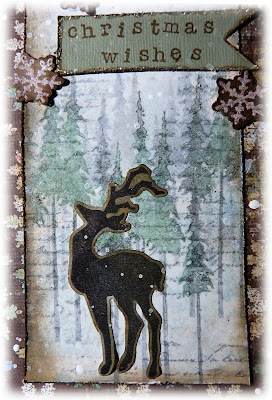 My tag is made with the Tim Holtz Holiday Joy Framelits set which are stamps and dies that fit together. (Hence my title). This is just one of the photos I am using as a sneak peek for my project which can be found over on the Country View Crafts Updates blog. If you are not toooooo busy with your own Christmas preparations I would love it if you could pop over and see me there. Thank you for visiting and for all your recent comments which I really appreciate. Welcome to new followers and thanks for being part of my creative journey, I hope you find something that inspires you to create your own art and come back when you can. Please leave a link so that I can come and see you too. Have a great week, mine seems to really be winding up with all the Christmas cards to get in the post and presents to finish off. And today I am teaching the Vintage Tag Journal to five lovely ladies who are regulars at my workshops. This tag is made with the Tim Holtz Holiday Joy Framelits set which are stamps and dies that fit together. (Hence my title). The background was a mop up from another project using faded Jeans and Brushed Pewter Distress Stains – smooshed on the craft mat and the tag dipped, spritzed and dried until I was happy with it. Over that I stamped a text stamp (I used one that had been sitting on my desk and I’m not sure where it is from) with Wendy Vecchi’s Watering Can Archival Ink and when that was dry I sprayed Dylusions White Linen ink spray several times drying inbetween bursts. The trees were stamped using two sizes, one from Mini Holidays 2 and the other from the Framelits set and again I used the Watering Can archival but mixed it with Olive Archival giving me the two tone look and creating a forest. I stamped the deer onto a piece of blue distressed patterned scrap of designer paper which can’t be seen now I have die-cut it and edged it with Walnut Stain Distress Ink. 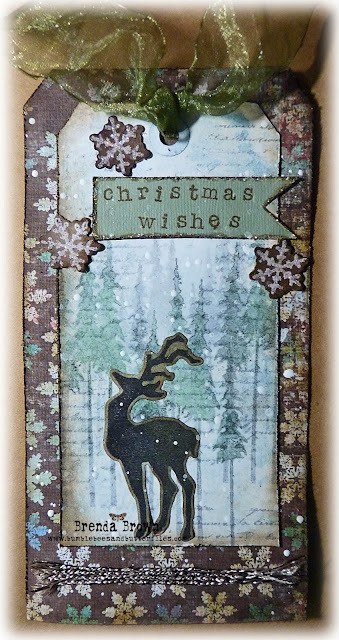 The stars were stamped with Embossing Ink, covered with sticky embossing powder and then quickly sprinkled with Glamour Dust when it was hot and sticky. I then die-cut them and blended Walnut Stain over the top and gently wiped the sparkly snowflake with a damp baby wipe to reveal the glitter again. 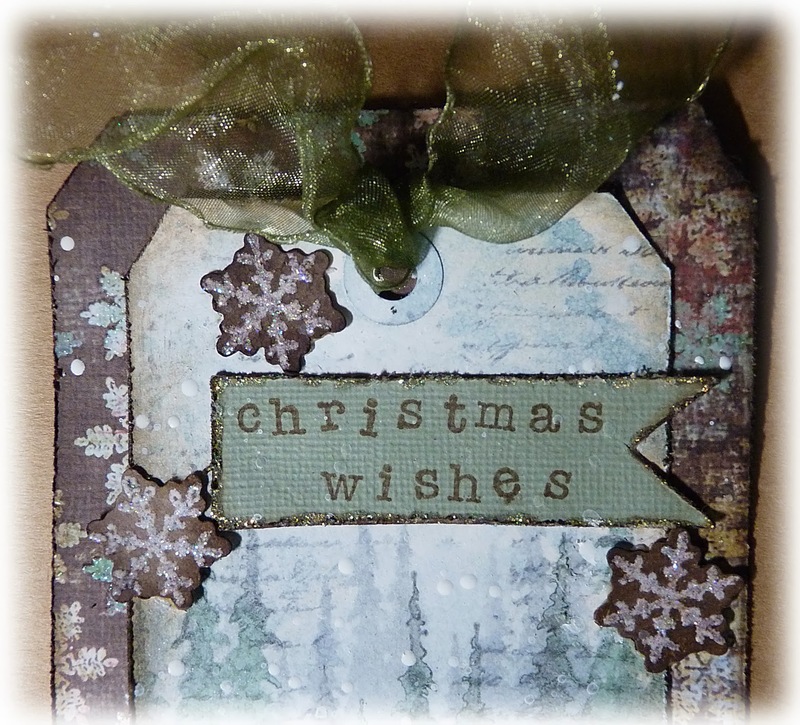 I extended the tag using a piece of card with a very similar snowflake on it, I think it was from MME. The sentiment was stamped using little stick alphabet stamps, cut into a pennant and edged with gold stickles. I admire and love your style which has such gorgeous alsmost effortless beauty and yet the talent and technique in there is amazing! Just been over, simply stunning, LOVE those two tone trees!!! Off to have a look - you are way more organised than me! It already looks so beautiful just in the peek - the layered trees have already captured my heart... can't wait to see the whole thing, so I'm on my way. Hope you've had a ball with your class today. It is a gorgeous winter scene! Great sneak peak... off to see more. This looks amazing Brenda. 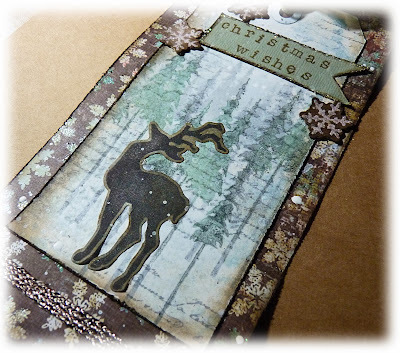 I just love the look of that watercolour type stamping. Off to have a much closer look. Intriguing peek... off to see! I went and I saw and I said WOW!!!! I am going to have to get me a Framelitz die - you made a gorgeous scene with the one you used.